LT15 Power | Economic sawmill designed specifically for maximum value at the lowest possible price. The LT15 POWER is an extra rigidly-constructed sawmill with a new heavy-duty bed system. This sawmill is designed to be as basic, rigid and simple as possible. 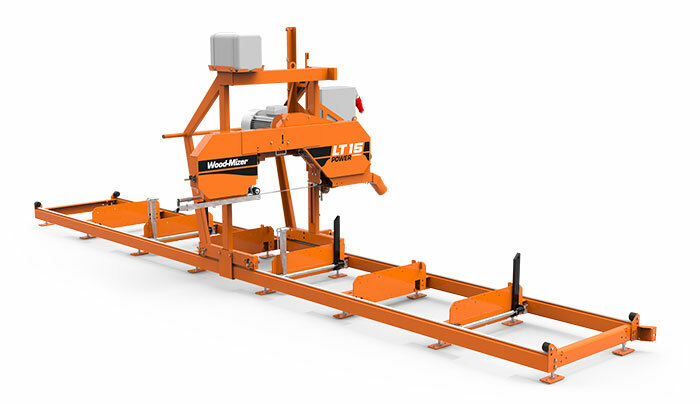 This sawmill is ideal for companies needing to increase their sawmilling capacity with minimal labour, lower maintenance costs, and ensure durability for the life of the machine. The LT15 POWER cuts logs up to 70 cm in diameter, has an 11 kW motor, electric up/down and push feed operation. Options include electronic setworks, power feed, and a debarker. In order to cut longer logs, bed extensions can be added to extend the sawmill bed to any required cutting length. Easy-to-operate blade tension system with included gauge. with fine adjust manual control. Secures logs and allows you to cut as low as 25 mm from the bed. Can be extended with optional bed extensions.